Basketball star Kobe Bryant is currently touring Asia, and was in China during the weekend to launch a new charity initiative. The Kobe Bryant China Fund will partner with the Soong Ching Ling Foundation to raise money within China for education and health programs. Bryant’s existing fund, the Kobe Bryant Family Foundation, will also educate school students in the U.S. about Chinese language and culture. It will pay the salaries of four teachers to teach Mandarin and Chinese culture to middle-school students. 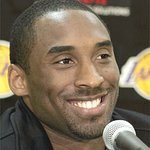 Bryant is touring Asia to share his basketball skills through the “NIKE Champion Returns – Kobe Training Camp”.